This article is a Movie/TV Tour. The Walking Dead Tour is a grand tour of Atlanta, taking you past various important filming locations for the highly acclaimed AMC TV series, The Walking Dead. Based on the series of graphic novels by Robert Kirkman, Tony Moore, and Charlie Adlard, the story revolves around a group of survivors making their way through a post-apocalyptic world overrun by "Walkers". The first season of the show was filmed in and around downtown Atlanta, Georgia, and by following this tour you will be able to see in person the filming locations of several iconic scenes. For those who have yet to partake in the viewing of this slice of zombie melodrama please note that the tour below does contain spoilers of certain plot points of the show. To really get into the spirit of the show we,the editors of this tour, highly recommend participating while done up in full zombie makeup. The citizens of Atlanta love nothing more than thousands of zombie tourists descending on their fair city. As Atlanta in the summer can be quite warm and humid, we recommend to travellers attempting to do this tour in June-September to dress comfortably (rags and blood stained daisy dukes are ideal!) and to bring plenty of water. While the downtown section of the tour is definitely walk-able, most of the locations are far too spread out so a car is definitely advisable. The tour starts at the Cobb Energy Performing Arts Centre located in the northern part of Atlanta. 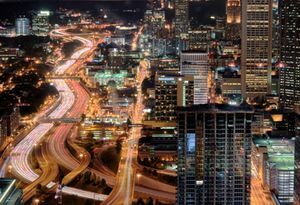 You can reach this place by taking I-75 (serving traffic from Detroit to Florida) or I-285 (commonly called the Perimeter by Atlantans, and the Atlanta Bypass on overhead signs) which circles the city at a distance of about 10 miles out, crossing and connecting with all the above freeways as well as the airport. The Cobb Energy Performing Arts Centre is right where I-75 and I-285 intersect. For the northern locations of the tour we recommend you bring a car as you will make 13.7 miles (22km) visiting 5 shooting locations. For the Downtown area, however, walking would be your best option. Most of the in-town neighborhoods are individually easy to walk around, with dense collections of bars, restaurants, and shops. For the southern part of the tour you can bring your car or use public transportation. Take bus 32 at 144 Spring St SW and exit at Georgia Ave SE and Cherokee Ave SE. 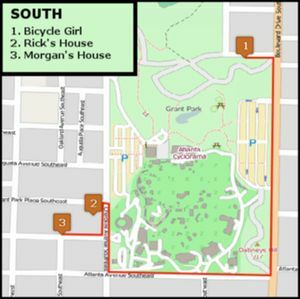 Then walk for about 0.3 miles through the Grand Park and you will see the first shooting location in the southern part of the tour- Bicycle Girl. Please be advised that street names in Atlanta are very confusing. There are more than 70 streets that have "Peachtree" in their name, and they are often difficult to distinguish (Peachtree Street, Peachtree Lane, Peachtree Circle, etc.) but if you follow the tour directions, you won't get lost. We begin the tour at the Cobb Energy Performing Arts Centre a great venue for Broadway shows, ballet, opera, concerts in the Atlanta area. The centre doubled for the The Centers for Disease Control and Prevention (2800 Cobb Galleria Parkway, Atlanta) complex that the group trek towards at the 'explosive' end of Season 1. Because it was believed that the CDC might hold answers to the origins of the plague and maybe even a cure, the location provides the main motivation for the latter parts of the season. The real CDC is actually located not far from this location at Emory University. From here we head northwest on Cobb Galleria Pkwy toward Akers Mill Rd before taking a right onto GA-3 North and then turning left onto I-285. We stay on I-285 for 3 miles and exit onto Atlanta Rd by taking a left. Then follow Atlanta for 3 miles until you come to Bolton Rd where we take a right and arrive at Atlanta Mission Administrative Offices." The office building for Atlanta Mission doubles as the Hospital (2353 Bolton Rd NW, Atlanta) that Rick wakes up from and discovers that the world has gone insane. Only the exterior shots of the hospital were filmed here but it is the key to emotional impact of the devastation that the apocalypse has wrought. Outside the hospital Rick enters a world of bodies, burned out buildings, and deserted military vehicles. To get to our next location we head back towards Atlanta Rd and continue south until we hit Chattahoochee Ave. Turn left on Chattahoochee Ave and continue for 1 mile and then turn left onto Ellsworth Industrial Dr. Here we arrive at the Vesta Holdings building which was used to film the exterior shots of the Sheriff's Station (1737 Ellsworth Industrial Blvd, NW Atlanta). This is where Rick takes Morgan and his son Duane after meeting them to procure both a shower and some guns and vehicles. Next we head back on Ellsworth Industrial Dr. and go south until you reach Elaine Ave where we will take a slight right followed by a left onto Marietta Blvd. Then we turn right on West Marietta St and continue for half a mile before we take a left on Johnson Rd. We finish with a left on Grove Park Pl which might be a restricted access road so please follow all signs before entering. 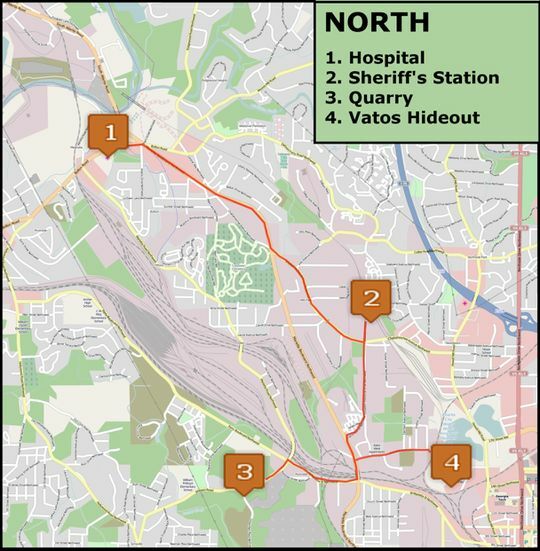 The road borders the Bellwood Quarry (279 Grove Park Pl NW, Atlanta) which served as the filming location for the camping grounds that the survivors rendezvous at for three episodes before heading to the CDC. It's here that Rick reunites with his family and also where Shane (in what might be a harbinger of his characters eventual descent into violence) lashes out at Ed for his abuses towards his wife and daughter. Finishing up our Northern section we head on Johnson towards West Marrietta St. before taking a right followed by a left onto Marietta Blvd. Continue for 0.2 miles and turn right on Huff Rd and conclude by taking a right on Foster St. where we arrive at The Goat Farm Arts Center, a 19th-century complex of industrial buildings and contains the studio space for over 450 artists, performers, designers, researchers, creative entities and small tech start-ups. This location was used to film the Abandoned Building (1191-1299 Foster St, NW Atlanta) scenes in the "Vatos" episode. This was the base for the gang that kidnapped Glenn forcing Rick, Daryl, and T-Dog have to do a prisoner exchange for their captive, Miguel. We start Downtown part of our tour at the overpass over Freedom Parkway where we see Rick ride into Atlanta (253 Jackson St NE) on his steed. To get here from The Goat Farm we head back North on Foster St and turn right onto Huff Rd. Next we take a right on Howell Mill Rd and continue for 1 mile before it turns into Marietta St. Stay on Marietta for 1.5 miles before turning left onto Ivan Allen Jr. Blvd. After crossing Peachtree St Ivan Allen Jr. Blvd becomes Ralph Mcgill Blvd continue for 1 mile before turning right onto Jackson st.
To get from one iconic scene to the next we continue south on Jackson St then take a right onto Irwin St. After 0.2 miles it becomes John Wesley Dobbs Ave and we stay on it for 1.2 miles before taking a right on Peachtree St. This is followed by a sharp left onto Forsyth St. Travel four blocks and you will reach the intersection of Forsyth and Walton where Rick in our next iconic scene was forced to bunker up in an abandoned Tank surrounded by the hordes of undead. From there it is a short distance to our next location. Just head north on Walton street for one block and we arrive at Fairlie and Walton where Rick first caught sight of a Helicopter reflected off the side of the headquarters building of Atlanta Spirit, LLC. Continuing on our tour, we travel west on Forsyth for 1.6 miles to (70 Forsyth St Southwest). This is garage that we see Glenn pick up his sweet Dodge Challenger. He uses it to distract the Walkers away from Rick and the rest of the survivors before getting away. 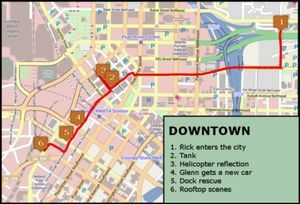 Right around the corner is (207 Mitchell St) The Loading Dock location where Glenn and Rick load up the rest of the group into the box truck and escape out of Downtown. We conclude our tour with another iconic scene the Rooftop (144 Spring St SW)where Merle loses his hand. To get there from the loading dock, head south on Mitchell St and then take a right on Forsyth. Continue on Forsyth until you hit Trinity Ave where you will turn right. Drive for 0.2 miles and the take a right onto Spring St. Unfortunately, the rooftop where the scenes are filmed is inaccessible to the public but you can walk around and take a look at the surroundings where you might recognize some familiar sights. To get to the southern locations of our tour just continue south on Spring St for 0.4 miles before merging onto I-20 East. Stay on I-20 for 1.6 miles and take the 59A exit for Boulevard toward Zoo Atlanta/Cyclorama. Next we turn right on Boulevard Se and continue for 0.5 miles until you can see Grant Park on your right hand side. From the location of where Bicycle Girl was (Berne St), head east toward Boulevard SE. Then turn right onto Boulevard SE. Keep going until you mean Atlanta Ave SE and turn right onto Atlanta Ave SE. Then Take the 2nd right onto Cherokee Ave SE. Rick's House (817 Cherokee Ave SE Atlanta, GA 30315) will be on the left. The next destination from Rick's House is Morgan's House (373 Ormond St SE Atlanta, GA 30315). From Rick's House, go back towards South on Cherokee Ave SE toward Ormond St SE (also, towards Atlanta Ave), and you will have to take the 1st right onto Ormond St SE. Morgan's House will be the on the left. A few scenes were filmed a little further away from Atlanta that would take quite a drive to get there. The intersection between (Highway 92 and Cascade Palmetto Highway) in the first episode of the series is where we see Rick pull up to an intersection looking for gas and walk down a hill to a gas station where he encounters a zombie. Here we’re introduced to Shane and Rick as they’re sitting in their Sheriff’s squad car having some lunch and a conversation. Lunch is abruptly cut short by an assistance call and they immediately drive off.This scene was filmed in the small town of Mansfield, GA which is about 60 or so miles from the downtown Atlanta, GA scenes. Here we see Rick, Shane, and the other deputies set up a road block to stop a car being chased by other law enforcement personnel. Upon cresting a hill the GTO drives over some spike strips, blowing out its tires, sending it into a spin and ultimately flipping over into a field. This entire scene was filmed on (Spears Ln close to Maddux St) a small side road just outside of Mansfield. Further south on Maddux St, we see the Farmhouse where Rick runs out of gas in his patrol car in “Days Gone Bye”. Rick walks down the road until he comes across a farmhouse and after making a grisly discovery inside, he notices a horse in a pasture and rides off toward Atlanta. In the post-apocalyptic world full of zombies survivors did not have the luxury of dining in many of the Atlanta restaurants. Food was scarce and survivors were living off the supplies they scavenged from stores and homes. However, most probably you will get hungry during the tour and would like to grab some food. Below are restaurants in a close proximity to the tour. 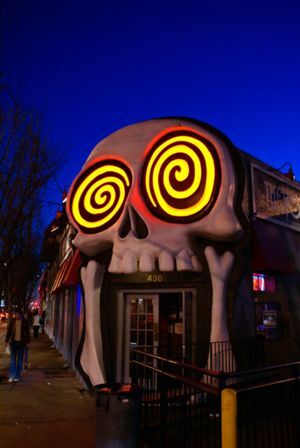 Even though it's not on our way, there is one more place that might be worth visiting, especially because of it's unique entrance- a giant laughing skull. It's about 3 miles away from the downtown locations, in district called Little Five Points. For more restaurant listings, please see Atlanta travel guide. Don't be a walker! Please be respectful towards any location that is a private residence or marked as private property. Follow all marked rules and regulations for parks and recreational areas. It's advised to visit locations during the day and to travel with a companion. For locations located in the wilderness, proper clothing and equipment are recommended in order to prevent injury or getting lost. Usual precautions should be taken, as in any other major city, such as not traveling alone at night and being aware of which neighborhoods are more prone to crime. 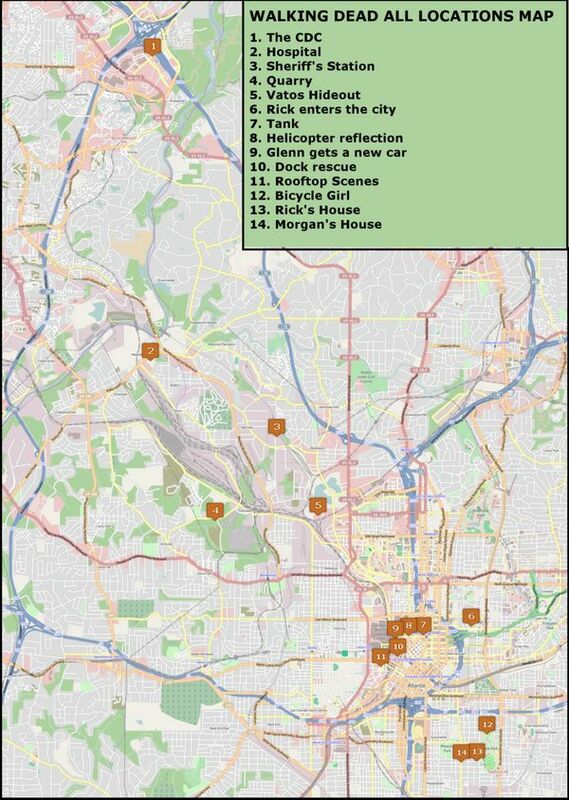 In Atlanta, the southwest and southeast areas have reported the most incidents of crime; the triangle created by I-285, I-75, and I-20 in particular is a dangerous neighborhood. Car theft is exceptionally high by national standards. Outside of the perimeter, crime rates are significantly lower (except Dekalb County). This page was last edited on 15 July 2017, at 17:33.